Located near downtown San Luis Obispo just inside the newly renovated Creamery area is a rare treat. Nestled in the corner lot off of Nipomo street is Goshi, an exceptional Japanese restaurant and experience. Along with its authentic and traditional food, Goshi serves the look and feel of Japan. Here you will find much more than just sushi and a bento box. With a range of menu options from simple sashimi to creative rolls and a variety of hot dishes, Goshi dishes up oishii (delicious) meals. On this trip, the Great Flavors Flavor Team teamed up with fellow blogger and friend Michelle from EnjoySLO and her husband Ray. 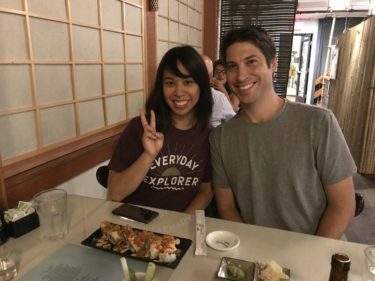 We were all excited about our taking a (virtual) trip to Japan to enjoy its culinary variety and explore what we all liked the best at this amazing restaurant. Here’s how the trip unfolded and the tastes we all enjoyed. Having traveled to Japan many times, Japanese food is one of my favorite types of food that I love to eat and enjoy. 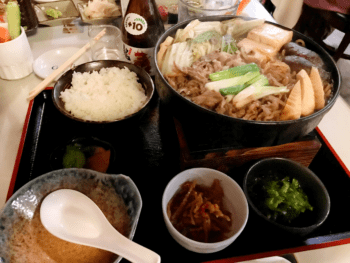 When you think of Japanese food, there are so many things that come to my mind like ramen, sushi, izakaya, curry, okonomiyaki, and so much more. With all these choices, it’s hard to categorize Japanese food into just one thing. In my mind, why I love Goshi so much is its traditional feel—both in food and touches. This is why my usual go-to here is the Sukiyaki dinner. This is a meal served in a cast iron pot that combines beef, tofu, yam noodles, and a delicious soy-based sauce that is to die for. A lot of restaurants tend to add some sugar and this sauce base can be a bit sweet. Goshi knows just how to balance that taste and brings the whole meal together. Served with a side of rice and pickled vegetables, it is a hearty meal in itself. However, don’t miss out by not ordering my second favorite dish there: the Garlic Chip Albacore sushi. If you miss this, don’t say I did not let you know about it. It is amazing and oishii up (majorly delicious)! Newly opened area and sushi bar. I’ve had the wonderful experience of traveling twice through Japan, exploring different areas of the country and practicing Aikido in dojos from the smallest towns far north in Hokkaido to the headquarters and foundation school in Tokyo. Some of my favorite memories are the little local restaurants, the warm hospitality, and the variety of local vegetables and fish. 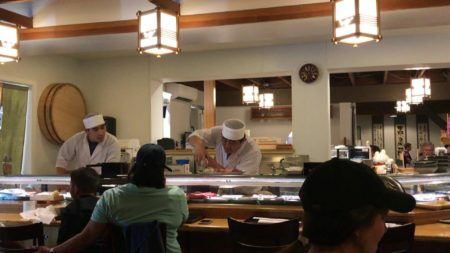 Goshi in downtown San Luis Obispo is a little gem outside of Japan, with the same feel, quality food, and attentive service. Being gluten free, however, Japanese food has pretty limited choices for me. Sad face. Off limits are the yummy ramen, tempura, udon, sukiyaki, curry, okonomiyaki, and other delights that others enjoy. But that’s ok. Because I can have all the sushi and sashimi I can devour. And do I ever! Not only is Goshi one of the best places for authentic Japanese food on the Central Coast, it’s got some of the best sushi and sashimi around—and the servers and chefs truly understand about Celiac and gluten issues. If you have to avoid gluten, you’ve found your Japanese restaurant. Just let your server know your food allergies and they will walk you through options and the chefs will omit the usual sauces and substitute gluten-free options. For example, they offer gluten-free tataki sauce, as well as tamari (gluten-free soy sauce). So, when we planned a dinner to Goshi with Michelle and Ray, I was looking forward to a great dinner of sushi. We arrived on a Wednesday night and had a very short wait. On Friday and weekend nights, the wait can be long, but the restaurant recently expanded the dining area downstairs, and added an upstairs waiting area where you can relax while you wait. I ordered the Albacore Tataki and Teriyaki Chicken. Tataki is a method of cooking that quickly sears the fish (or meat) over high heat, leaving the center nicely rare. Then it’s sliced thinly and topped with a citrus-ginger sauce. Truly an amazing combination. Alongside was a tender cut of grilled chicken, since I opted out of the teriyaki sauce. We shared a Rainbow Roll, eight pieces of sushi with a variety of the freshest fish. And fine Japanese dining deserves a fine Sake to enjoy along with dinner. If you like Sake, be sure to check their list of options. There are many good ones to choose from, and a great accompaniment to their delicious Japanese cuisine. I look forward to going to Goshi any time the opportunity arises. If you haven’t been, do try it out—gluten-free or not! It’s delicious and a great tribute to the cuisine and warm people of Japan. Michele and Ray enjoying some albacore sushi with garlic chips. Feeling sushi? Look no further! It’s time to take a trip to Goshi, located in the heart of downtown SLO’s Creamery Marketplace, on Higuera. Make sure to get there early or make reservations in advance, this place fills up quickly even after their new expansion. Even if you’re a walk-in and there is a line, you’ll find plenty of little boutique shops in the area to keep you busy or stop by The Cider Bar for a quick drink. After your sushi craving has been met, make sure to stop by Nite Cremery for some gourmet ice cream. The entry way of Goshi is small and feels a bit confined, but as soon as you walk in the room opens up considerably and feels open and welcoming. Once we were settled into the restaurant we had a great time with the best company, Andrew and Kara from Great Flavors! With our group of four we all ordered something different so that we got to taste many things on the menu. Every dish was delicious, but the Sukiyaki and the Garlic Chip Albacore Sushi really stood out. The Sukiyaki is filled with tender flavorful beef and vegetables that you can pour over rice….which I highly recommend you do because the broth from the Sukiyaki is deliciously unique with a silky rich buttery flavor. You gotta sop it all up! This is the perfect dish for the upcoming cool SLO nights. If you are looking for sushi and love spice order the Garlic Chip Albacore Roll. Enjoy fresh albacore topped with smelt egg, green onion, spicy sauce, Sriracha and perfectly crisped garlic chips. So many awesome flavors and textures in one bite. Have a friend who’s eating light? Or perhaps someone who gets extra hungry? Add on their chicken curry bowl for just $5 — a small meal in itself! If it’s been a while since you dined at Goshi, be sure to check out the new expanded space and updated décor. If you haven’t yet tried Goshi, you’re in for a treat. We all had a great time at Goshi exploring the fun, flavors, and culture of Japan. With so many options to choose from, there really is something for everyone. Plus, the setting and service invite you to sit back and enjoy the experience. 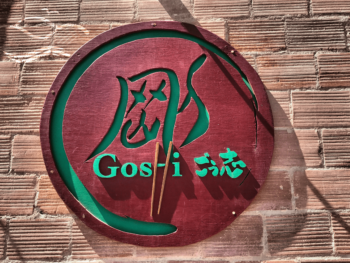 What do you like best about Goshi? We’ll see you there soon!